Typical Bermudagrass/Zoysia process to a beautiful Alabama lawn in Montgomery area. This application is for control of most broadleaf weeds present and for control of crabgrass which germinates later. This application is for control of most broadleaf weeds which have emerged since the first application and of crabgrass which will germinate later plus a complete spring fertilization for a healthy green-up and steady growth. Full service customers will receive an application of our technologically advanced fertilizers. This application is formulated to maintain healthy, green turf throughout the entire summer. This application is for control of most warm season weeds which will germinate in the heat of the summer. This application is for control of most cool season weeds which germinate in the fall plus a complete fall fertilization to help condition your grass for the winter. 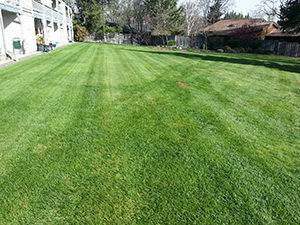 An application of lime to lawns on non-prairie soils. Lime raises the ph which increases the avilability of many nutrients. That improves root and top growth, vigor and tolerance to many stress factors such as heat, drought, cold, traffic, etc. We offer additional services at additional cost. The additional weed control and disease control applications generally are the same price as your regular application price. The cost can be prorated pending on the area(s) treated. The additional insect control applications are mare than the regular application cost. Please call for positive identification of the problem for a free quote.